Who has the longest carwash conveyor in the world? 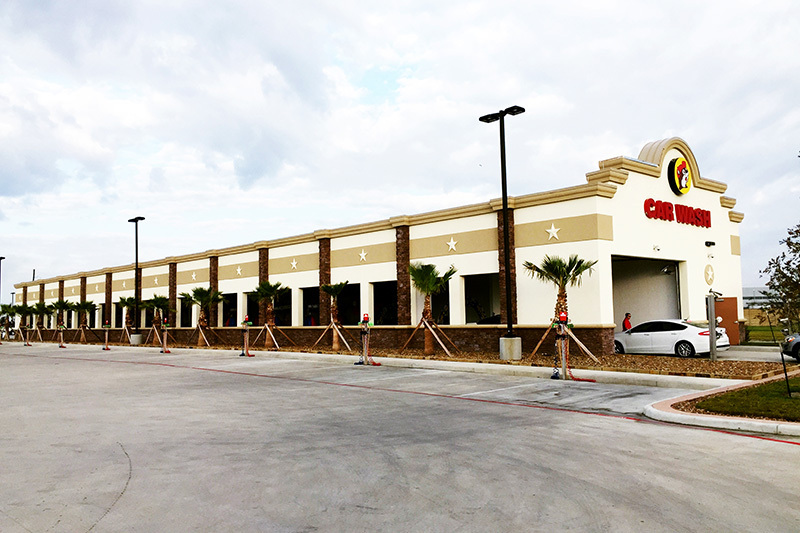 According to Guinness World Records, a convenience store company called Buc-ee’s just built and opened the longest carwash conveyor at its location in Katy, Texas, in September 2017. The wash’s conveyor is measured at 255 feet long, and this length was verified with an actual visit to the site. Two months later, on Nov. 16th, a judge from the Guinness World Records organization visited Katy and declared Buc-ee’s now the holder of the record for the longest carwash conveyor in the world. But, there is a lot more to this story. Although Buc-ee’s is relatively new to the carwash industry, it has been in business for many years. The company is not very large in terms of number of locations. However, the size of its locations and its reputation is another matter. For example, in the size department, the store in Katy is approximately 55,000 square feet, has 120 gas pumps and employs over 275 employees at that one store alone. Furthermore, according to its survey in the U.S. in September 2017, the marketing company Gas Buddies declared Buc-ee’s to have the highest rating in the nation for the best gas station customer service. Buc-ee’s has 33 locations in Texas with four of them also having conveyor carwashes. The reason it built such a long carwash conveyor in Katy is that it wanted to ensure the best possible wash for its customers and to be able to do so with the absolute minimum fresh water and chemical usage. More length allowed more dwell time as well as the benefit of being able to wash more vehicles per hour. This was a theme echoed by other carwash owners with long conveyors. In the course of conducting research for this article, nearly 100 carwashes and manufacturers were surveyed. In the conveyor segment, several other very long conveyors have been built. For example, Valet Auto Wash in Lawrence Township, New Jersey, has a 245-foot conveyor among its four locations. Burlington Auto Spa in Burlington, Ontario, Canada, has a 225-foot-long conveyor and is building a second long conveyor location in Missasauga, Ontario. Wiggy Wash in Orem, Utah, has four locations, and its longest conveyor is 205 feet. Valet Carwash in Cambridge, Ontario, Canada, is a 10-location chain, and its longest conveyor is 200 feet. So, based on our research, conveyor carwashes that are 200 feet or longer are in a pretty exclusive club in the carwash industry. In researching the Top 50 carwash companies as reported in Professional Carwashing & Detailing’s November issue, only one company, Mister Car Wash, indicated that it had a location with a conveyor that is over 200 feet. In addition to the U.S. retail chains, one of the major European chains, Mr. Wash in Germany, was also contacted. It did not have any conveyors over 220 feet, nor was the company aware of any in Europe of this length or longer. The second major group that was contacted was the largest manufacturers and suppliers of carwash equipment in the world. Out of the 35 contacted in Germany, Spain, England, Canada, China and the U.S., none were aware of any conveyor longer than the 255-foot record-breaker in Texas. These manufacturers confirmed that they collectively had installed (or participated, in some way, in the installation of) over 180,000 carwashes of all types, and not one was aware of any conveyor longer than the record. In fact, without exception, all of them had to do some research to find the answer to the question of what their longest washes are, because they had never been asked before. What often happens when a new world record has been established for the first time is that people are now aware of something that has not been actively pursued before. In this case, one of the major reasons is very obvious: cost. Most conveyor carwashes are a lot closer to 100 feet in length than 255 because the costs of constructing the building and equipping such a long conveyor are enormous. And, when there are some 50-foot-long carwashes washing 300,000 cars, the return on this type of investment is far from a sure thing. That said, the carwash industry has often attracted entrepreneurs who boldly go where no one has gone before. And, in this case, no one who has built these long tunnels has had any regrets in doing so. It will be interesting to see if this sparks a trend and if anyone goes after the record. Editor’s note: Information, including measurements noted, was not verified by this publication. Although Guinness World Records verified claims made in this article, Brink Results performed the initial research of carwashes mentioned in this article.